This week on Supergirl: The writers have been reading my #Sanvers diary, Cadmus attacks the city, and Lena Luthor chooses a side. Day one of the CW crossover event and well, I’m sorry if any of y’all tuned in just for the crossover because it was miniscule, at best. I’m not that sorry because I want more people watching Supergirl, but if you’re going to watch, watch from the beginning. 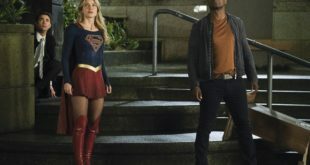 As it stands, “Medusa” was much more of a regular Supergirl episode with a smattering of crossover plot where Barry and Cisco showed up at the very end to steal Kara away. I’ll get to my theories on the importance of this episode later on, but for now, the re-re-re-recap! Supergirl starts off with a Thanksgiving theme and suddenly it’s like that episode of Friends where Ross is all, “It’s THANKSgiving, not TRUTHSgiving.” Both James and Alex want to spill their respective secrets but before they both get drunk enough to blurt out the truth, a breach appears over the table and presumably everyone has a very quiet dinner after that. Mon-El brings actual stuffing (like for pillows) to dinner in an attempt to make him more likable. The jury is still out on whether or not it worked. Hank/Cyborg Superman’s attack on the bar that killed dozens of nameless aliens was orchestrated as a test by Cadmus to see if their restructuring of the Medusa virus had worked. Spoiler alert: it did. Mon-El isn’t killed right away because he’s a named character and this is TV where white dudes have 10 lives, but he inhales enough of the stuff to at least be on bed rest for the rest of the episode. 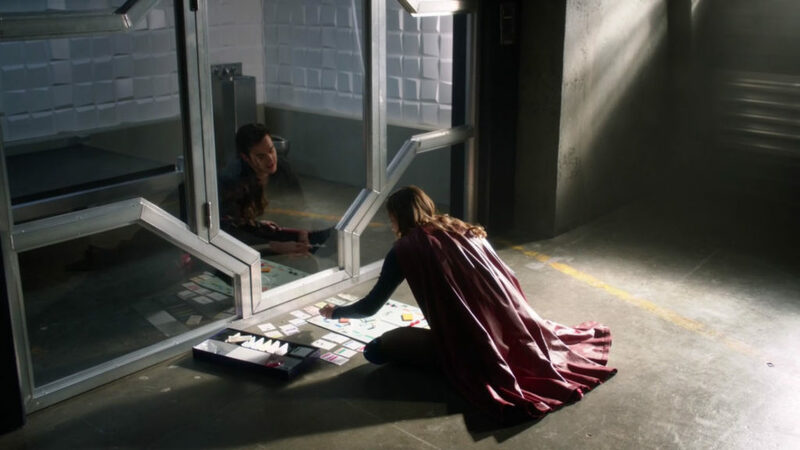 At least he sticks to what he’s good at on Supergirl: Laying there and looking pretty. But hey, since Eliza cured both Mon-El and J’onn in record time, don’t you think the DEO would want to hire her ASAP? I know that the Luthors aren’t exactly the conventional family, but Mama Cadmus visits baby Lena at the OFFICE during Thanksgiving weekend and can’t even pretend to be familial? “Oh hey, Lena, you’re working, I’m working, let’s go get a pumpkin spice latte and pretend it’s lunch.” I guess that’s not how Mama Cadmus bonds with her children, though, especially not the one she openly admits to disliking. 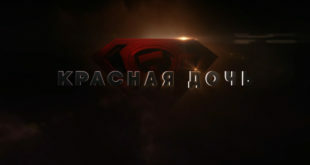 After the attack on the bar, the DEO learns that Cadmus stole Kara’s blood, not to clone her (or maybe they will, eventually), but to access Fortress of Solitude and steal the plans for the Kryptonian-made Medusa virus. Kara, after having an existential crisis over the truth about her mother last season, is faced with the reality that her father wasn’t as squeaky clean as she once imagined. I know some might think this is a rehash of old plots, but I actually think it’s important for Kara’s growth to come to terms with the fact that both of her parents were flawed. 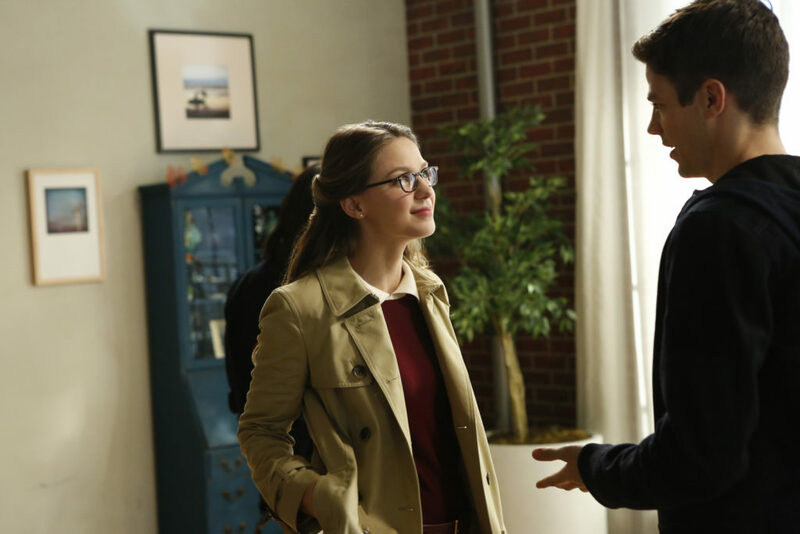 She’s quick to make assumptions about Daxamites when she first meets Mon-El, but over time she’s learned that not everyone is good or evil. Sometimes, like her aunt Astra, good people do bad things because they think it’s right. On the surface, Zor-El making the Medusa virus seems wholly evil, but when faced with the extinction of life on his home, what else could he have done? Kara would argue there’s always another way, but as my friend Dumbledore says, “Dark times lie ahead of us and there will be a time when we must choose between what is easy and what is right.” I fully expect dark times ahead for Kara and she’ll have to remember the decisions her parents once made and make tough choices of her own. The second was that the lesbian love interest, Maggie, was shot by Cyborg Superman, but instead of falling victim to the “Bury Your Gays” trope, she wore a bulletproof vest (Like my boo Nicole in Wynonna Earp!) and she ultimately recovered. Thank goodness the CW is looking to make up for all that heartache they caused us last spring. After a sexually tense moment between Supergirl and Lena, wherein I was almost certain Supergirl was going to kiss Lena to bring her to the light side, Lena denies her mother’s involvement with Cadmus. Lena is a character who knows she has been an outsider her whole life. She’s not really a Luthor to the actual family but she’s still seen as one by everyone else. She throws herself into her work because that’s all she has. No one will ever see her as anything but someone with the potential to be evil. And I fully believe that it’s Kara’s faith in Lena that helps keep her grounded in the good side. It would be easy for Lena to become a Draco Malfoy (like all these HP references? ), swept up in a family legacy, eager to fit in, but Lena is stronger that that and she uses that family name to her advantage when she takes Mama Cadmus by surprise. By switching the isotope in the Medusa virus, she effectively neutralizes it and saves the aliens in National City, returning the Kara’s heroic favor. As I mentioned earlier, Mon-El spends most of the episode on bed rest because he’s, well, dying. It’s clear to everyone but Kara that Mon-El has feelings for her, but why he doesn’t just act on them is beyond me. Mon-El has been forward about everything so far, so there has to be more to him not wanting to be with her other than the possibility for rejection. I have a hunch that our boy Mike is actually a prince on Daxam, which is why the other Daxamites (I assume) are looking for him and his pod. This would explain why he’s okay with one-night stands and kissing Kara when he thought he was dying: those aren’t long-term promises. I have to assume he’s romantically promised to someone else back on Daxam. I suspect we’ll spend the second half of season two learning more about him and I hope it turns out well because right now? He’s dry toast. That’s not saying he can’t be with Kara for a while. “Karamel” is an ADORABLE ship name. They’re cute enough and I like the whole “our families are enemies” plot because I’m a romantic trashbag, but ultimately I still ship Winn-El and SuperCorp because I want Supergirl to be Supergay. Our second kiss, and the better of the two, came as a complete surprise to me. I knew that Alex would be coming out to her mother in “Medusa,” but I certainly didn’t think Maggie would act on any feelings. Remember: I was a fan of the slow burn. Maybe it was being shirtless during Alex’s “new normal” speech, maybe it was the near death experience, or maybe it was the flattering pajama bottoms, but Maggie decides that enough is enough. Life is too short to not kiss the girls she wants to kiss and dammit she wants to kiss Alex. And Alex, a girl after my own heart, takes the romantic moment and ruins it with her humor. And it’s WONDERFUL. ALEX IS SUCH A NERD. MORE NEWS AT 10. I know I wanted the slow burn, but that’s only because I want Alex and Maggie to be end game. I love the two of them together so much it hurts and their growth over the past few weeks has been more than I ever thought possible on network television. I think the reason why Supergirl was included in the crossover was not to make the character feel left out but because I imagine she’s going to bring an important weapon to the table when it comes to defeating the Dominators: Medusa. Kara is currently struggling with the notion that her parents weren’t the heroes she thought when she left Krypton. They were flawed like she is now and I think once she’s faced with a situation where she has to alter Medusa to kill Dominators, she might have a greater understanding of both her father and Cadmus. I know there are some folks who are upset about the screen time Sanvers is getting and to those of you I say: shove off. 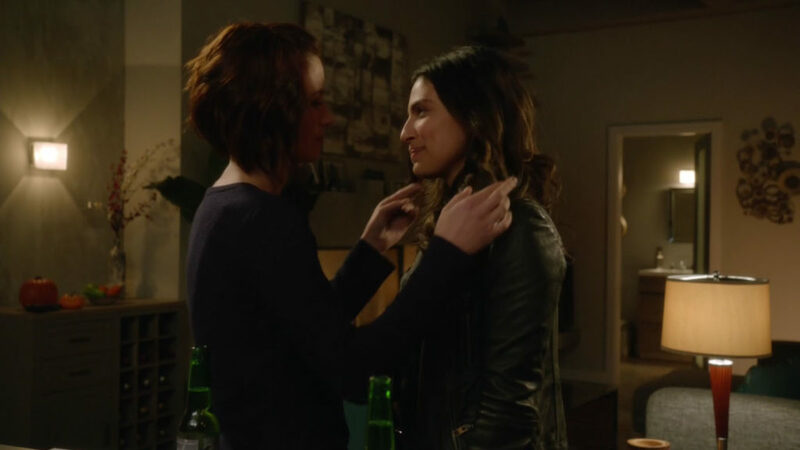 Alex’s arc and her newfound relationship with Maggie have been given VIP treatment, something rarely afforded to any gay character on television. If the romance and the character development makes you not like the show because you want more action, you’re watching the wrong DC show. 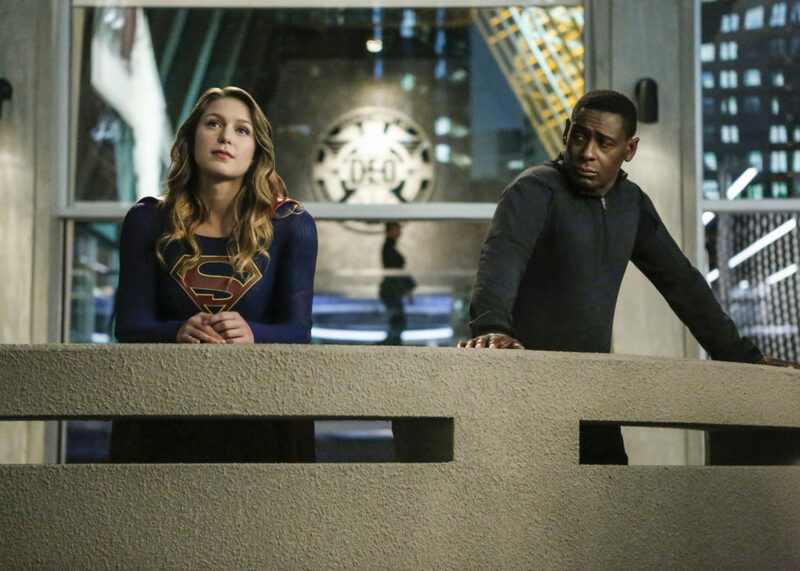 Supergirl has always been more about the relationships between these characters. If you want action or pulpy fun, try Arrow or Legends of Tomorrow. Let me keep my romantically hopeful Supergirl as it is. On a related note: Kara made mention on the balcony that the view reminded her of Krypton, a view she often quietly shared with Cat Grant. Maybe I’m reading too much into it, but Kara connecting Cat to something from Krypton is beyond sweet to me and my goodness, can we please trade Mike for Cat? I miss her. What the heck was that off-screen save of Martian Manhunter? In two seconds Eliza Danvers manages to reverse what is happening to J’onn’s blood? Can she manufacture that and possibly save some other green-turned-white Martians? Why isn’t she currently working for the DEO with that brain? Also that “save” was lame and completely wrecked what should have been some amazing character development for J’onn. I hope he and M’gann aren’t being pushed to the side. Also, is M’gann still in a cell? Did someone bring her Thanksgiving dinner? Y’all are cold at the DEO. Supergirl airs Mondays on The CW at 8pm EST. I’m sorry, how can you mention drunken alex without mentioning alex getting her beer taken away from her only for her to sneak into the hiding place it was in and steal the hard liquor instead? I can’t BELIEVE I forgot to mention this! GAH. I have failed. Forgive me? I have hope for Meghan because they very conveniently sequestered her JUST before villains targeted aliens at her bar, saving her for future shenanigans. Also, thanks for calling out the annoyed straight people. This arc has been so stunningly effective to me because I am going through all the things (except the actual tough or any love interest) along with her, and they are getting all the questions and hesitations right. They are going through it at light speed, to be sure, but that’s just network TV and compassionate writers. They COULD have made us WAIT 7 weeks. P.S. Also not happy at the seeming sidelining of M’gann… but I do have a certain amusement in hindsight at just what “an important weapon to the table when it comes to defeating the Dominators” was.